Last year when Anna and I jetted off to London and Paris for three weeks, we stopped over in Dubai for a few days on the way home to Sydney. As you can imagine, Dubai is an incredibly decadent city. It’s an ideal destination for any traveller as it effortlessly combines adventure and relaxation. One day you could be skiing on the slopes at Mall of the Emirates, and the next day you could be indulging in some serious pampering at one of Dubai’s luxury hotels (such as Per Aquum Desert Palm and Anantara Dubai The Palm Resort & Spa). Let’s not forget how fashion-forward Dubai is, either. Remember that time last December when I met the ultimate Queen of Fashion at Bloomingdale’s in The Dubai Mall? The ultra-modern destination was one of the first cities that Sarah Jessica Parker launched her shoe collection in and a lucky few (hundred) were able to meet her upon the purchase of a pair of her fabulous shoes. My SJP-signed shoes are probably my most valuable possession! 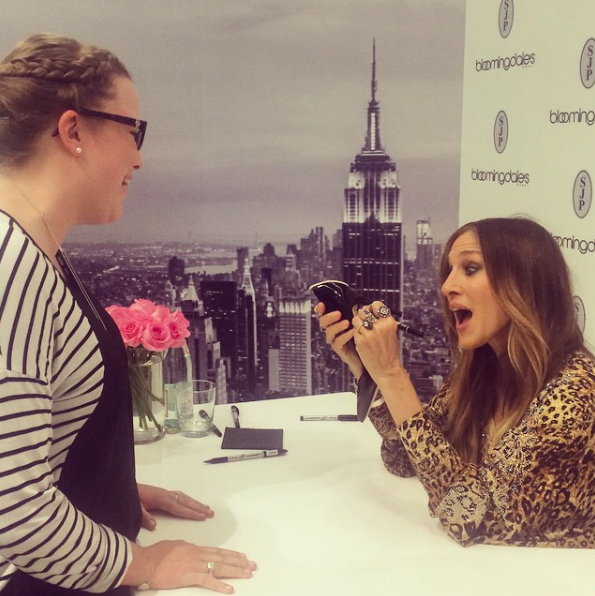 Meeting SJP in Dubai and discussing everything that BFFLs would! After our whirlwind stop-over in Dubai, I am now telling everyone to go to Dubai. Not as a stopover on the way to/from Europe, but as a destination! Champagne brunches, desert safaris, climbing 828 metres to the top of Burj Khalifa, sightseeing, skiing, exploring Old Dubai and the vast array of souks (textiles, gold and spice) and shopping at the largest malls in the world are just some of the many things Dubai has to offer. Dubai is a very warm city (as you can imagine), so pack light. We were there in December (their winter) and it was around 30 degrees celsius everyday. Dubai and the rest of the United Arab Emirates are more conservative than Australia, so make sure you pack clothes that cover your shoulders and go to your knees. This Witchery Tie Shirt dress is ideal as it breathes well in the Arabian heat and can be styled in lots of different ways. We flew with Qantas to Dubai last year and it was only a 14 hour flight. 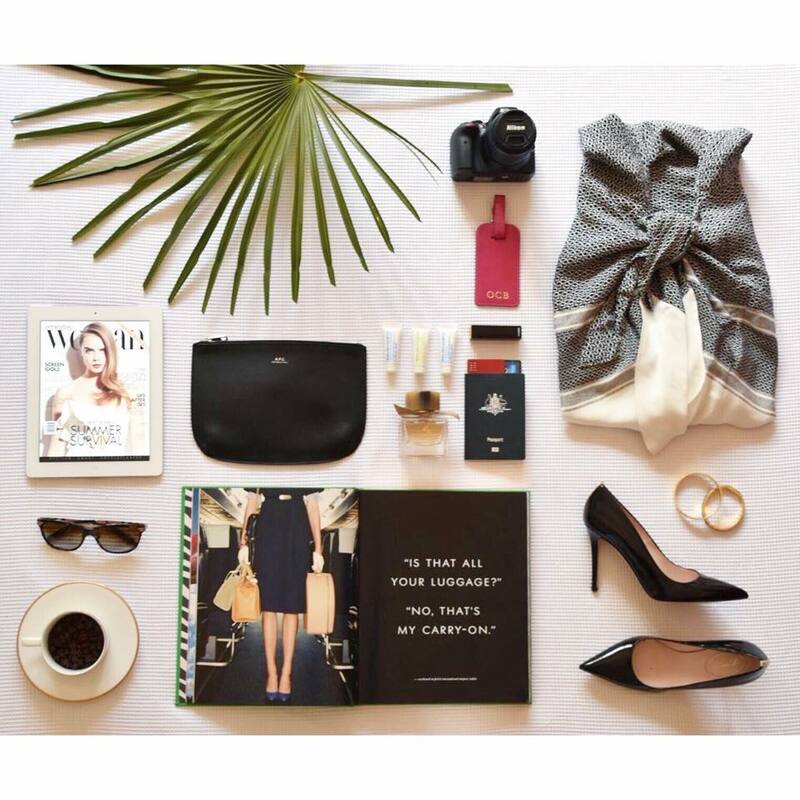 Magazines (such as the Emirates Woman), Malin + Goetz skincare products and monogrammed luggage tags are in-flight essentials. If you’re lucky enough to be visiting Dubai on a Friday, make sure you attend a champagne brunch. A perfect way to either start or end your holiday! The SJP Collection ‘Fawn’ pump is the ultimate shoe to help you drink endless amounts of Moët! Anna and I went on an Arabian Adventures ‘Sundowner’ desert safari and we had the best time! Although our 4WD got stuck on a sand dune (I was in the front seat and was FREAKING OUT), our guide was an absolute hoot! Every time we stopped (for the falcon show, to see the sunset or dinner at the campsite), he made sure he took a million photos of us. Not just any ordinary photo though, he styled us as if we were models “bend your knees, look slightly towards the left” – hilarious; we could not stop laughing. If you want to be a model for the day, a good camera and sunglasses are obvious essentials for this must-do Dubai experience. Don’t forget your credit card because you will literally want to buy one of everything at Mall of the Emirates and The Dubai Mall.